This volume, the first in Brill’s Japanese Visual Culture series, vividly describes the efforts of the Japanese monk Shunjōbō Chōgen (1121–1206) to restore major buildings and works of art lost in a brutal civil conflict in 1180. Chōgen is best known for his role in the recasting of the Great Buddha (Daibutsu) and the reconstructing of the South Great Gate (Nandaimon) of Tōdaiji in Nara and its huge, dramatic wooden guardian figures. 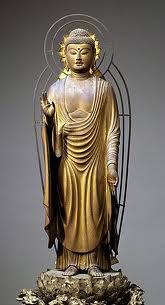 This study concentrates on these and other replacement statues and buildings associated with Chōgen and situates the visual arts of Japan into the spiritual … read moreand socio-political context of their times. Through meticulous study of dedicatory material, Rosenfield is able to place the splendid Buddhist statues made for Chōgen in vivid new light. The volume also explores how Japan’s rulers employed the visual arts as instruments of government policy – a tactic that recurs throughout the nation’s history. This publication includes an annotated translation of Chōgen’s memoir, completed near the end of his life, in which he recounts his many achievements. In chapters on East Asian portraiture, Rosenfield claims that surviving statues of Chōgen, carved with mordant realism, rank among the world’s most eloquent portraits, and herald the great changes that were to permeate Japanese religious and secular arts in the centuries to come. 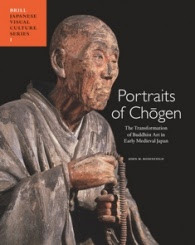 While Chōgen has been the subject of major art exhibitions and extensive research in Japan; this is the first book-length study to appear in the West. Chōgen was a luminary of the period who raised funds for the rebuilding of the Daibutsuden 大仏殿, the giagantic "Buddha Hall" at Tōdaiji Temple 東大寺 in Nara, which had been burnt to the ground in +1180 during the Genpei War 源平合戦 (Genpei Kassen, + 1180 to 1185). Chōgen was also a fervent believer in Amida Buddha 阿弥陀如来 and Pure Land faith (Jōdokyō 浄土教), and from +1183 he started giving his friends Buddhist names that contained the name Amida. Kaikei is credited with creating an independent sculptural style known as Annami 安阿弥, also called Annamiyō (Annamiyo) 安阿弥様, which literally means “Annami Style.” The name of this style stems from Kaikei’s own unique inscription, for he signed many of his works “Kaikei of the Buddhist name AN AMIDA BUTSU,” writing AN in Sanskrit. He received this special Buddhist name from his friend, the Buddhist priest Chōgen (Chogen) 重源, the latter a famous monk (+1121-1206) who introduced the so-called Daibutsu Style (Daibutsuyō) 大仏様 of architecture to Japan, which he had learned while visiting China.
. Gyoki Bosatsu 行基菩薩 and Temple Todai-Ji. The shrine is located up on a steep slope, the 天狗坂 Tengusaka. It was established more than 1200 years ago by 聖徳太子 Shotoku Taishi to venerate Bishamonten. The main days of rituals are on days with a 3, where many people come to venerate. 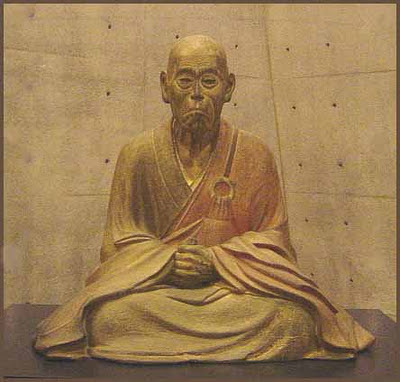 During the time of 敏達天皇 Emperor Bitatsu Tenno (538 - 585), a statue carver named 安阿弥 Annami came from 百済 Kudara, Korea, and carved the statue of Bishamonten.